DARLINGTON, SC (July 27, 2015) – Joining in Darlington Raceway’s celebration of the early 1970’s during its Labor Day weekend events, will be country music legend Tanya Tucker, who will perform the National Anthem for the Bojangles’ Southern 500 on Sept. 6. Tucker, a longtime Nashville recording artist, will sing the Star-Spangled Banner live on NBC. For four decades, Tucker’s sultry voice and vivacious stage presence has helped to make her one of the most admired and respected female vocalists in the country music genre. Part of that appeal lies in the fact that her resume contains some of the most groundbreaking songs of the format’s history. Songs like Alex Harvey’s Delta Dawn, Dallas Frazier’s What’s Your Mama’s Name and David Allan Coe’s Would You Lay With Me (In A Field Of Stone) firmly established Tanya Tucker as an artist from whom you could always expect the unexpected. Her early hits also contained some kick-up-your-heels moments, like Texas (When I Die), San Antonio Stroll, and Here’s Some Love. Tucker’s anthem performance adds yet another element to an already exciting 1970’s-style pre-race. She will join legendary rock band Grand Funk Railroad, who will be performing the pre-race concert for the 66th running of the Bojangles’ Southern 500. Fans have the exclusive opportunity to watch the Grand Funk Railroad concert from the front of the pre-race stage. In addition to the purchase of a Bojangles’ Southern 500 grandstand ticket, a pre-race access pass may be purchased for an additional $45. This pass will not only give fans stage front access for the concert, but will also include an up close view of the Sprint Cup Series drivers as they are introduced to the crowd. 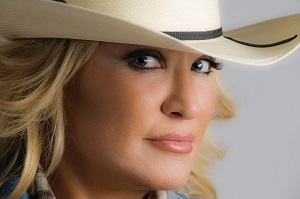 Get all the latest on Tanya Tucker, by visiting her on Facebook.com/TheTanyaTucker, or on Twitter @Tanya_Tucker. She is currently on tour through CTK Management.